Conservationists from Still Wild Still Threatened have today taken peaceful direct action in Butlers Gorge to highlight the ongoing destruction of this area of important wildlife habitat. Two conservationists have blocked access to a logging road. They are sitting on the road, chained to each other and are willing to risk arrest. Still Wild Still Threatened is today releasing footage taken within threatened forest of Butlers Gorge. The footage includes several healthy Tasmanian devils as well as spot tailed quolls, echidnas, pademelons and other animals. 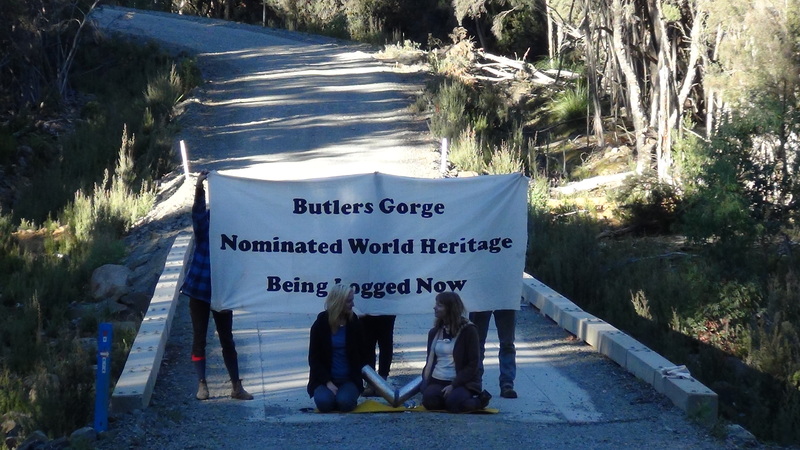 “Areas like Butlers Gorge have been nominated for World Heritage because they are globally significant forests. Habitat for wildlife, and in particular endangered species, is a critical value of these forests that needs to be protected” said Miranda Gibson, spokesperson for Still Wild Still Threatened. “We are releasing footage today that shows a diversity of wildlife living in these threatened forests. Remote sensor fauna cameras have captured evidence of endangered species including Tasmanian devils and spot tail quolls in these areas that are being logged right now” said Ms Gibson. “Based on legal advice, a letter was sent earlier this week to Minister Tony Burke outlining the legal course of action he can take as Environment Minister to bring an end to logging in the forests he has nominated for World Heritage” said Ms Gibson. “Tony Burke needs to take responsibility as Federal Environment Minister for the destruction being done right now to the homes of endangered species in these World Heritage nominated forests. Over 60,000 protests emails have been sent from around the world, calling on the Federal Government to immediately end this logging. Yet, Minister Burke has ignored these calls from the international community. ” said Ms Gibson. “The values of these forests are being assessed by the IUCN in Paris, and meanwhile those very values, including the significant wildlife habitat in these forests, are being destroyed by logging. It is an absolute hypocrisy” said Ms Gibson. Click HERE to send a message to Prime Minister Julia Gillard and Minister Tony Burke. Posted on March 5, 2013, in Media Releases, Videos. Bookmark the permalink. Leave a comment.